An upcoming lecture at Lynchburg will focus on race and the criminal justice system. Paul Butler, a former federal prosecutor turned scholar, will speak Monday, April 2, at 7:30 p.m. in Sydnor Performance Hall. The talk is free and open to the public. Butler is the Albert Brick Professor in Law at Georgetown University Law Center and one of the nation’s most frequently consulted scholars on issues of race and criminal justice. 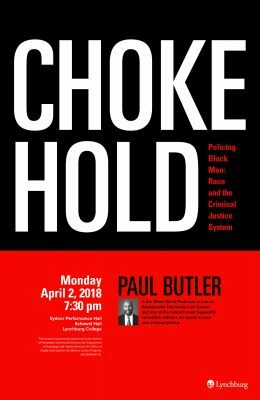 His 2017 book, “Chokehold: Policing Black Men,” argues that racial disparities in the criminal justice system exist by design, rather than by accident, and that current efforts to reform law enforcement will not create lasting change. Dr. Ashley Thompson, chair of the sociology department at Lynchburg, invited Butler after hearing an impressive talk based on his book last year. In addition to educating the audience about a variety of lesser-known examples of racial bias in the criminal justice system, Butler argued that racial inequities exist by design, rather than by accident. He explained that African American identity is rooted in “the spirit of resistance” against slavery, Jim Crow laws, and other forms of oppression.